A 'Foreigner' Quota for Soccer? 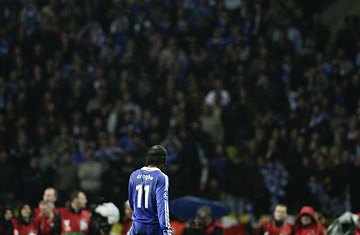 Chelsea's Didier Drogba, orginally from the Ivory Coast, leaves the field in Moscow. When the English soccer team Chelsea took to the field in Moscow on May 21 for the final of UEFA's Champions League, Europe's biggest club competition, its West London roots were all but invisible. A Czech goalie backed up a Portuguese central defender. Players from France and Germany marshaled Chelsea's midfield. The lone striker was from Ivory Coast. In all, of the 11 players who kicked off that game at the Luzhniki Stadium, only four were English. Not good enough, reckons FIFA, world football's governing body. At its annual congress in Sydney on Friday, delegates backed proposals capping at five the number of foreign players top soccer clubs can field at the start of a game. Buoyed by the support  155 voted in favor of the resolution, and only five against  FIFA plans to explore the idea further with the hope of imposing the limits by 2012. "There is a growing sporting and economic inequality" between clubs, said Sepp Blatter, FIFA's president, taking aim at wealthy European teams able to cherry pick from the world's best talent. The impact of such restrictions would be huge: fewer than one in five line-ups taking to the pitch in last season's English Premier League would have complied with the proposed limits. Arsenal, Chelsea's crosstown rivals from North London, regularly fields an all-foreign team. But the bigger challenge for FIFA is that in their current form, the proposals are flat-out illegal, because they flout the European Union's rules permitting workers the freedom of movement among member states. FIFA's plan drew a "red card" from Vladimir Spidla, E.U. Employment Commissioner, ahead of the Sydney meeting. The E.U. does back an existing scheme imposed by UEFA, European soccer's governing body, that requires clubs competing in the region's top tournaments to have a minimum of six "home-grown" players in their squads, who are required to have been trained by their club, or by another in the same country, for at least three years between the ages of 15 and 21, regardless of their nationality. But UEFA doesn't demand that local players actually take the field, as Blatter's more draconian FIFA proposal would. He has said he would push ahead on making that far more visible change with "consultation, not confrontation." Whether or not FIFA can win the E.U. around  and it's unlikely it will  one thing is clear: international football's governing bodies are perturbed by the commercial might amassed by England's Premier League. As by far the world's richest soccer league  club revenue grew 11% in the 2006/7 season to $3.6 billion, according to figures published Thursday by consultants Deloitte  the contribution from foreign players, coaches and investors has grown rapidly in recent years. With legions of foreign stars lured by the piles of cash accumulated from the lucrative sale of TV rights, only a third of players starting games last season would have qualified to play for England. Foreigners now own eight of the 20 teams: Russian Roman Abramovich owns Chelsea, Americans George Gillett and Tom Hicks own Liverpool, and former Thai Prime Minister Thaksin Shinawatra owns Manchester City. English clubs are so internationally dominant that they have filled three out of the four semifinal places in the last two seasons of UEFA's Champions League. That is something Blatter said Friday he's keen to "remedy", pointing to the English national team's failure to qualify for next month's European Championships as proof that the foreign presence in the Premier League is detrimental to English players. UEFA president Michel Platini has already questioned the loyalty of Premier League team's foreign owners, and suggested such overseas investors are damaging clubs' identity. But with clubs accumulating muscle and money right across Europe  until recently, the most powerful were grouped together into a representative organization known as G-14  FIFA's proposals may also be an attempt to re-emphasize the governing body's authority. For instance, rich clubs across the continent paying vast sums in players' wages have long bickered with FIFA's national soccer federations over the release of those players for international matches, something FIFA requires of clubs. Responding to the vote in Sydney, meanwhile, the Premier League is unmoved. "We want to see the greatest possible number of England-qualified players coming through in the Premier League, but this has to be based on merit and quality," it said in a statement Friday. "And there is no doubting that foreign talent has aided the technical development of the English game." As for Chelsea, its amassing of foreign stars didn't help this month in the Champions League final. It was beaten by Manchester United. The number of foreigners in Manchester's starting lineup? Just five.